Cuban ‘Campismo Popular', a recreation project created in 1981 after the suggestion of Revolution leader Fidel Castro, has expanded offers this year in the country’s central province of Sancti Spiritus. Booking is possible here for similar facilities in other provinces. According to Hernán Cancio Lorenzo, head of the business in this province, booking is possible here for similar facilities in other provinces, and accommodation arrangements are quite easy. With a view to increase incomes, the abovementioned enterprise offers the so-called trip packages for local facilities. Once the ‘Campismo Popular’ business was taken over by the Cuban Ministry of Tourism, bookings can be also be made in the facilities’ reservation desks. Local facilities are currently submitted to restoration works prior to the high season period to begin in June. 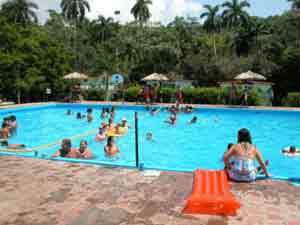 There are several facilities of this kind in Sancti Spiritus all of them found in beautiful and exuberant countryside places like Planta Cantu, Monacal, Arroyo Lajas, Bamburanao, Poza Azul and La Hormiga.